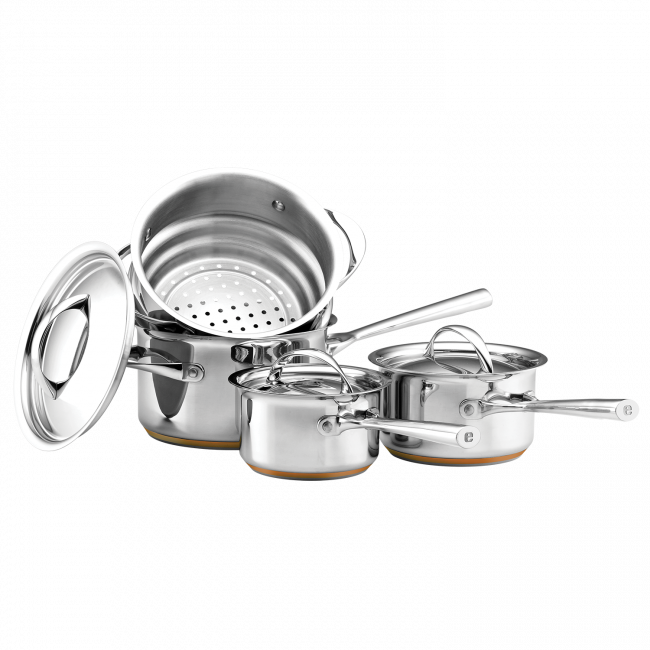 The Essteele Per Vita 4 piece set contains everything you need to boil, simmer, poach and steam. Featuring 14cm, 18cm and 20cm saucepans, plus a 20cm steamer. All items in the Essteele Per Vita collection are made from high-quality stainless steel, with solid copper bases to provide superior heat distribution. 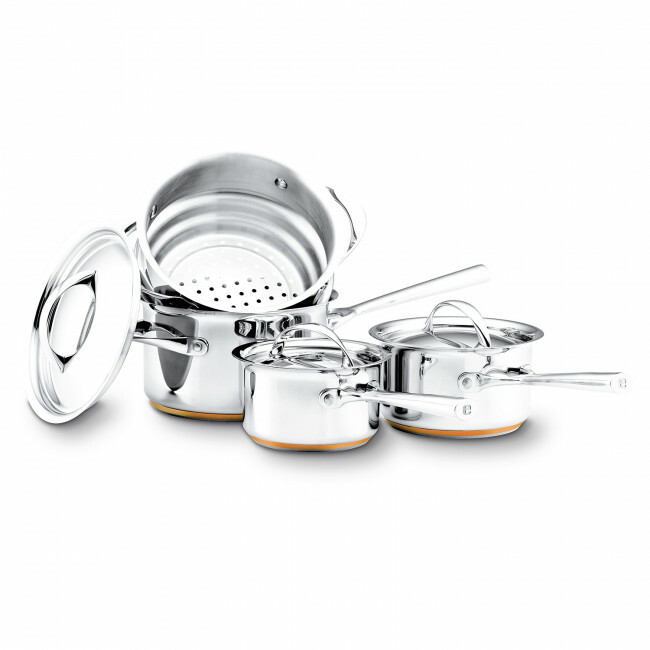 The set includes stainless steel lids, and all items are induction stovetop suitable, dishwasher safe, and oven safe to 240 degrees. The Per Vita collection combines Italian elegance with a 60 year Australian heritage, bringing you flawless, beautuful looking cookware that continually performs. Essteele Per Vita 4 Piece Cookware Set is rated 4.8 out of 5 by 12. Rated 5 out of 5 by Anonymous from Sturdy, efficient. My first saucepans are from the seventies. Copper bottoms, slightly different handles and tops yo these. They are still going strong with almost daikply use. One even has survived an exploding can!!! Can't value them highly enough. Many thanks, I have shared the love over decades. Rated 5 out of 5 by Lisa J from Awesome! I've had these for about a month and they are so much better than saucepans I've owned in the past. They look great, durable, cook well and are easy to clean. You just need to read the instructions and look after them correctly. I got these at 40% off, so I was really happy with the value. Rated 5 out of 5 by Kaz49 from Perfection I bought this set a month ago and couldn’t be happier. Have always had Essteele cookware and have never been disappointed. Love to cook with and very easy to clean.